China is currently the world's second largest economy in terms of GDP at current prices (12.015 billion dollars) behind the US and the first for GDP at the same purchasing power (23.208 billion dollars). Real GDP growth in 2017 was 6.9% and the IMF estimate for 2018 is 6.6%. One of the main development and transformation trends in China is urbanization; in 2017 the urbanization rate reached 58.5% of the total population, equal to about 813 million people. At present China has six mega-cities (with population over 10 million inhabitants) and 10 large cities (with populations between 5 and 10 million inhabitants). Consumptions destined to Chinese households is growing steadily and has doubled in the last ten years on a per capita basis. Shanghai and Beijing are the cities that have the highest per capita home spending amount, respectively 12,264 euros and 11,187. 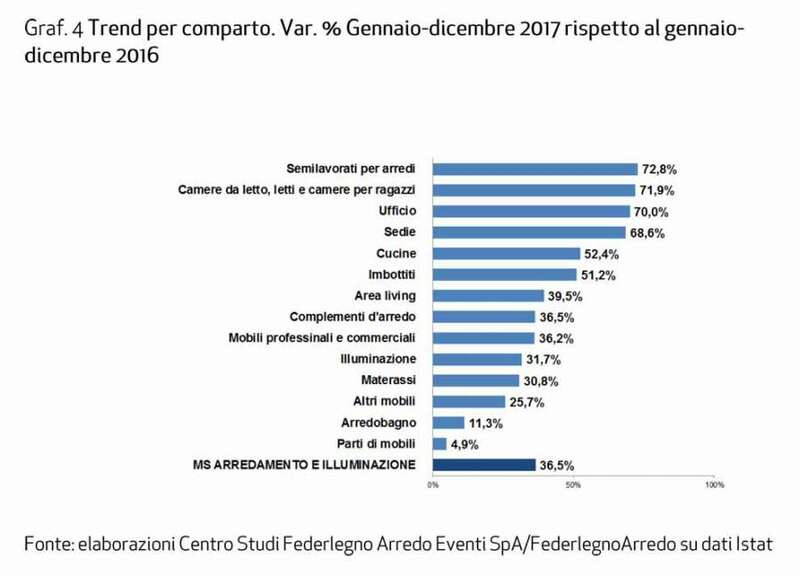 The furniture sector rose to 4th place among the Made in Italy sectors most present in Chinese import, starting from the 17th position of 2015 and the 22nd of 2012. 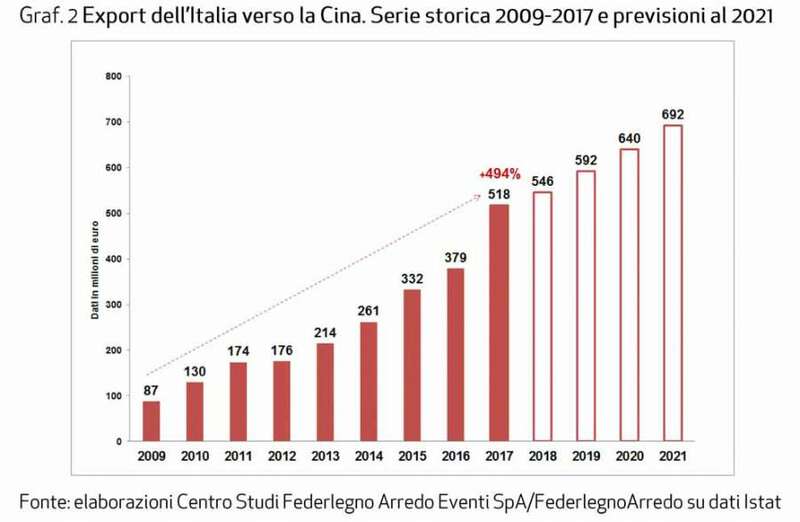 According to data from FederlegnoArredo, furniture exports (Furniture and Lighting Macro-system) to China grew steadily from 2009 onwards, reaching a level of + 494% in 2017 compared to 2009. In 2017, China was the 7th destination market for Italian Furniture and Lighting Macro-system exports, the second non-EU (considering Switzerland as an EU country), gaining a position compared to 2016 and surpassing Russia. In the same period, the growth in exports of the Furniture and Lighting Macro-system was + 36.5% compared to the same period of 2016, making it the highest among the top ten export markets of our exports. The most driving sectors are the Semi-finished products for furnishings that grow by + 72.8%, Bedrooms (+ 71.9%), Office (+ 70%) and Chairs (+ 68.6%). Almost half of the export to China is represented by three sectors: Upholstery (where we are the first suppliers) which account for 20% (101.5 million euro); Other furniture (wooden furniture not included in the other categories and furniture of other materials such as plastic, bamboo, wicker or rattan) which cover 17% of the total (89.1 million euro) and the Living area with 59.3 million of euros (11% of the total). Among the other sectors, furniture parts are the largest with 55.3 million (11%). 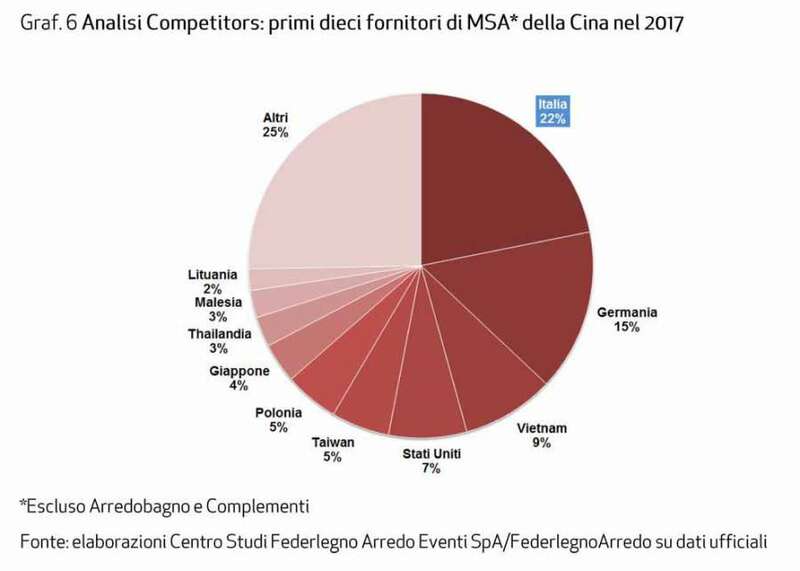 Compared to its competitors, Italy is the country that sold the most in China in 2017, confirming its position as the leading supplier of furniture (22% of total Chinese imports). In second place we find Germany with 15%. 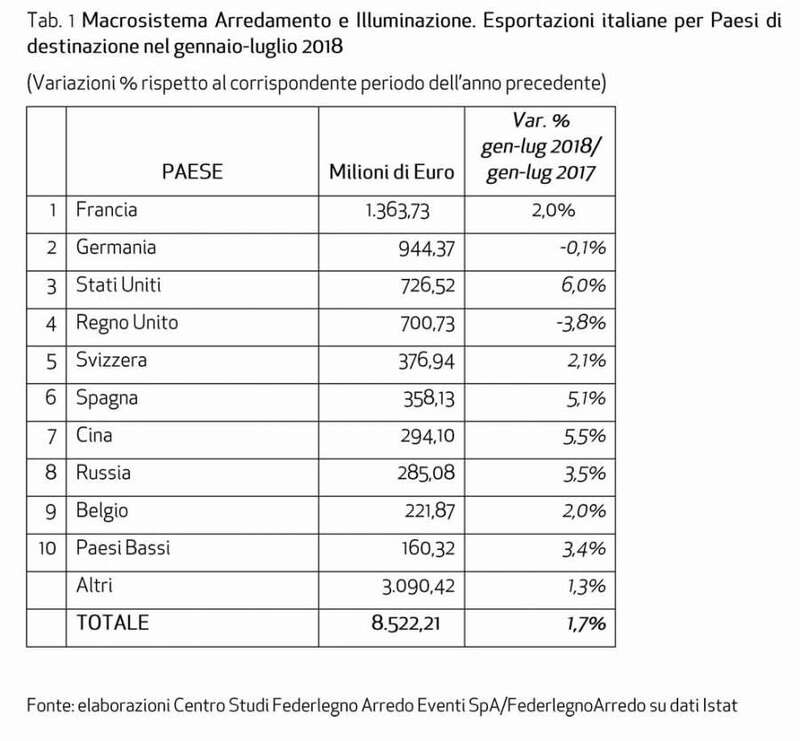 In the first seven months of 2018, China confirms its 7th position among the top 10 destination markets of Italian Furniture and Lighting Macro-system exports. The growth in the period January-July 2018 has slowed (+ 5.5%), but is still one of the highest in the top ten countries. In the first seven months of 2018, the upholstery was the sector that most of all drove the growth of Italian exports. From the 22nd to the 24th of November the third edition of the Salone del Mobile.Milano Shanghai took place at the Shanghai Exhibition Center, which this year has again been confirmed as an essential international stage for Italian brands looking to the East and a privileged point of observation on the dynamics of the eastern market. 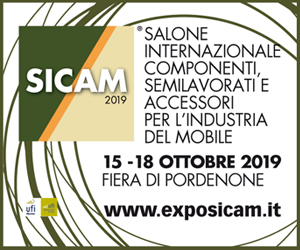 123 companies presented the best of Italian production and design and found a positive response and interest from a very numerous and qualified public. 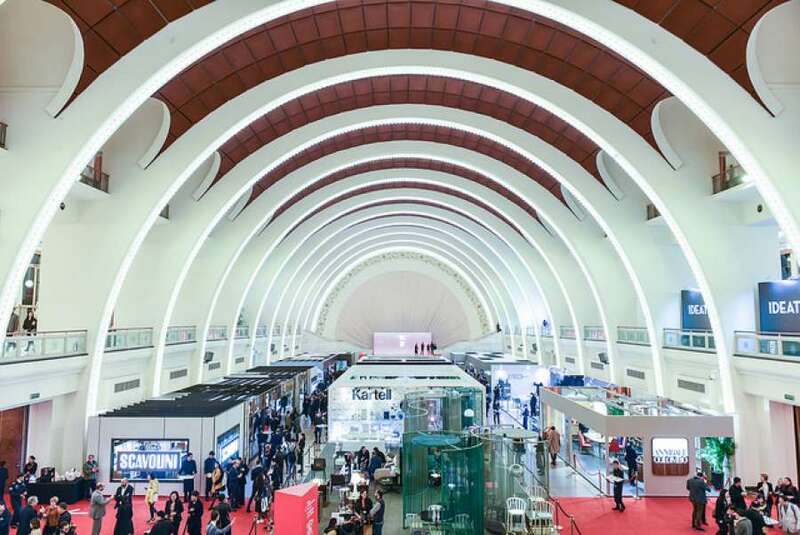 The over 22,500 presences witness the strong growth of highly selected operators for an increasingly recognized event throughout China. 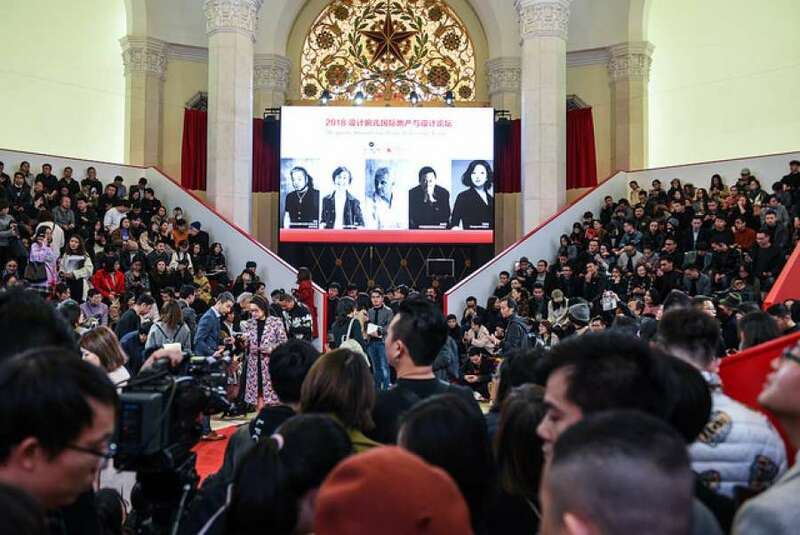 In addition to the confirmation of Shanghai, with Zhejiang and Jiangsu, the increase in attendance from Beijing and Guangdong is important, followed by Shandong, Fujian, Sichuan, Henan and Hubei. The potential for development is very encouraging: Italian brands, in fact, are gaining more and more consumer confidence, proving capable of identifying the appropriate sectors and channels to travel and positioning on the market with a precise and strong identity. Claudio Luti, president of the Salone del Mobile, said: "We close the third edition of the Salone del Mobile.Milano Shanghai with great satisfaction. We are aware that China is increasingly becoming a reference market for our companies and together with them we have been able to represent the best of our know-how with a wide and varied offer that has found a positive response and interest from the new public, not just from Shanghai. We presented ourselves also supported by the institutions. I believe that, only by being united, we can have the solidity and the ability to really create interesting business opportunities for the whole system. There is a great desire to know the Italian experience, the product and its history and we can tell it and present it to the best even with the support of our architects and designers who accompany us in the narration of the added value of Italian design. 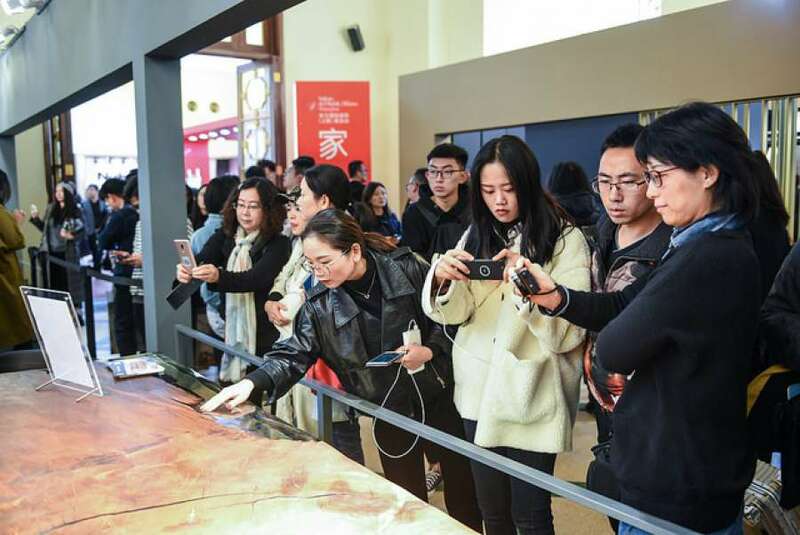 The success of the Shanghai edition is also an opportunity for the attraction of an increasingly large Chinese audience for the Show in Milano". 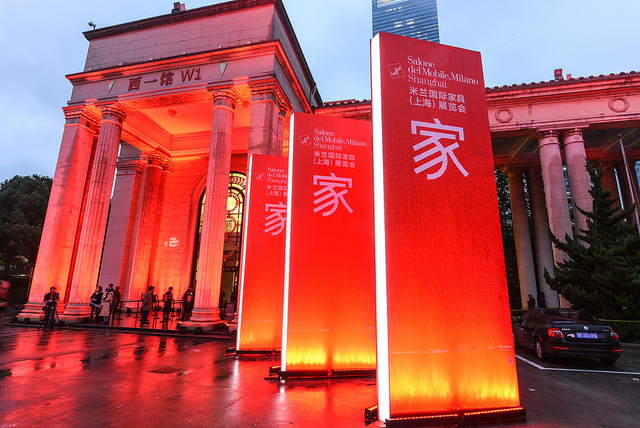 The event proved to be the perfect meeting point between the growing number of Chinese consumers who dream of Italy, love their taste, creativity, quality of life and products, and style, innovation and skill artisan of furniture and design companies for which China is a key market for expansion. "An extraordinary edition that confirmed the expectations of the eve - commented Emanuele Orsini, president FederlegnoArredo - The satisfaction of the companies and the great turnout of carefully selected specialized operators confirm once again the correctness of the strategy adopted to successfully deal with the Chinese market". 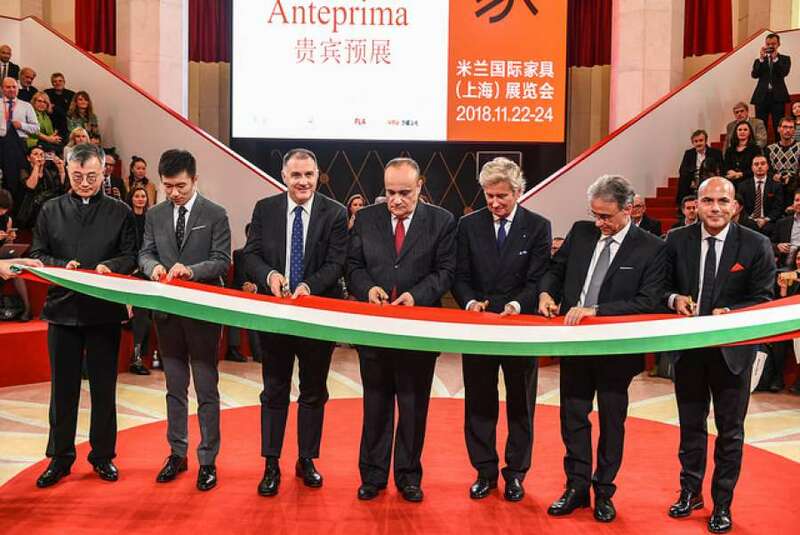 Federlegno Arredo Eventi decided to adopt a long-term strategy to make China an accessible market for Italian companies. The path chosen to achieve this goal is to make a system. Creating a system makes it possible to fill the dimensional gap that separates Italian SMEs from the great Chinese giants. Not only that, making a system also means presenting oneself to the Chinese interlocutors as a unique and strong team in which institutions such as the ICE Agency, the Embassy of Italy in China, the Ministry for Cultural Assets and Activities and the Ministry of Development Economic and companies dialogue at various levels with Chinese partners.